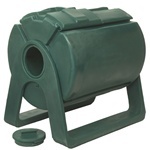 Composter FAQs | Compost Tumbler Bins | Free Shipping! Composting is the natural process whereby organic materials break down and decompose. Everything composts eventually on its own. With compost bins and tumblers, we are simply aiding the process so it goes faster. So why is composting so beneficial? There are several reasons. First, as any good gardener knows, compost is THE BEST thing you can possibly put on your plants. Compost is full of good nutrients your plants love, making it the best possible fertilizer. By adding compost to your soil, your plants will grow bigger and better than you ever imagined possible! Second, composting is basically just recycling, which we all know is great for our environment. With a compost bin or tumbler like the ones we sell here at Home Products 'n' More, you can make your own compost at home for free! That's right, all those things you've been throwing away like kitchen scraps and lawn refuse can be recycled into valuable compost for your gardens. So why should you compost? Because it's good for your garden and great for the earth! There are two types of composting, aerobic and anaerobic. Anaerobic composting is the traditional method of decomposition. A compost heap or pile that isn't turned regularly would be an example of anaerobic composting. In short, anaerobic composting means that you pile up the materials to be composted, and they simply rot. Anaerobic composting does take quite a bit of time, because the anaerobic bacteria are rather inefficient. Furthermore, anaerobic bacteria do give off methane and sulfate gasses as a byproduct of the decomposing process--these are the gasses that smell offensive to humans. Aerobic composting on the other hand, utilizes aerobic bacteria to break down the material. Aerobic bacteria are far more efficient at breaking things down, meaning the composting process goes a lot faster. Additionally, aerobic bacteria don't give off any offensive methane and sulfate gasses that smell bad. Aerobic composting usually produces very little odor. The bottom line is there are pros and cons to both methods. Aerobic composting requires some element of work, because you have to keep the material aerated. Anaerobic composting requires little to no effort, but it's slower and can be smelly. Home Products 'n' More sells both aerobic and anaerobic composting units. Be sure to read the product detail pages carefully to determine what type of composting method each unit utilizes, and if you have questions, feel free to call us and ask. Almost all organic material can be composted; however, if you don't want your compost bin to smell, we recommend that you do NOT add meat, dairy, or eggs. Your goal when adding new materials to your bin is to achieve a good balance between carbon-rich materials (also called browns) and nitrogen-rich kitchen/garden waste (also called greens). The goal should be a 2:1 ratio of brown to green in your compost bin. If you add too many browns, the composting process will slow down. Adding too many greens will cause your compost to smell. Remember, aerobic composting should not be a smelly process. If you do smell something unpleasant, it's easy to fix the problem by adjusting your brown to green ratio, or, if you have a tumbler rather than a freestanding bin, just spin the tumbler more frequently to encourage more aerobic bacteria growth. Your goal with a composting bin is to produce compost as quickly and efficiently as possible. The best way to do this is by creating the ideal conditions for composting. Several of these things we have already discussed above. For example, getting the right ratio of browns to greens is important. Adding too many browns to your compost bin will slow down the decay process. Furthermore, aerobic bacteria need oxygen to thrive and break down organic matter. If you are using a tumbling bin, you should rotate the drum at least 3 full rotations twice a week, as a minimum. 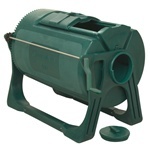 For faster composting, turn your compost tumbler more often, daily if possible. Temperature is another important consideration when composting. Optimal composting temperatures range between 70-100 degrees. If the compost becomes too cold (below 55 degrees), decomposition will slow or stop completely. If you're in a warm area, it may be beneficial to keep the compost bin in a shaded area to make sure it does not get too warm inside the unit. Moisture is also important to the composting process. If the material inside your compost bin is too dry, it won't break down. When adding water to your compost bin, aim for damp material (like your lawn or garden is after watering). Do not saturate the material, because the aerobic bacteria cannot thrive in too wet of conditions, either. When adding new material to your compost bin, be sure to chop up the items as small as possible. Large pieces or chunks of material will take longer to decay. The more surface area the material inside the compost bin has, the faster the decomposition process will go. Lastly, bacteria are a very important part of the composting process. When you first begin using a new compost bin, it will take about 6 weeks to build up enough bacteria inside the unit for consistent composting to occur. You can aide the buildup of bacteria by adding already composted material (if you can get some from someone else) or top soil to the compost bin when getting started. Over time, you may notice various other creatures like insects, fungi or worms may be calling your compost bin home. These creatures are beneficial to your compost and chemicals should not be used to eradicate them. They will actually help your compost to break down more quickly.